Celebrate the New Year in timeless Viennese style with an exciting gala evening held at the impressive neo-Gothic Vienna City Hall on the 31st of December. Guests are promised a truly unforgettable experience as they greet the arrival of the New Year with a glass of sparkling wine, wonderful views across the old city of Vienna, and the unmistakable music of the Waltz King, Johann Strauss, the Younger, ringing in their ears. The New Year's Eve Gala offers a full and varied programme of musical entertainment, an exquisite four-course dinner and dancing into the small hours. 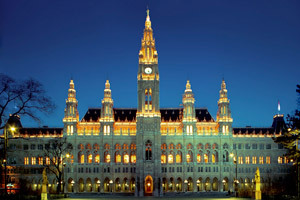 The venue for the gala is the City Hall's elegant and exclusive ‘Festsaal’ ballroom whose magnificent interior is adorned by no less than sixteen glittering chandeliers. Doors open at 7.00 p.m. ready to receive diners with a musical greeting from the Wiener Hofball Orchester. Once seated at their tables, guests are served a welcome cocktail. The four-course gala dinner begins at 8.00 p.m. accompanied by classics drawn from the popular Viennese repertoire. A splendid ceremonial opening of the ball follows at 10.15 p.m., showcasing the talents of the Young Ladies’ and Gentlemen’s Committee as its members re-enact the heyday of the Viennese Ball when debutantes were formally introduced into society. Afterwards, guests are free to come down onto the dance floor or watch on from their tables as the entertainment gets into full swing. One of the highlights of the gala, at 11.15 p.m., features a spellbinding performance of arias, duets and three ballet pas de deux dances. Favourites from the traditional Viennese operetta repertoire, performed by professional soloists and dancers, contribute to the ambiance of an evening that will stay in the memory forever. Then, as the turn of the year approaches, guests gather outside on the grand balcony to toast the New Year with a glass of sparkling wine, accompanied by The Blue Danube waltz and a spectacular firework display. Once the clock has struck twelve, midnight snacks are available from the gala buffet while the music and dancing continue well into the night. Now it is the turn of the gala’s live band, Midnight Spirits, to entertain you playing hits from the 1950s through to the present day before the gala finally comes to a close at 2.30 a.m.
New Year’s Eve is always a time to remember and enjoy with our friends and loved-ones, but celebrating it in Vienna turns what is a special occasion into a magical one.